These photographs were all taken on the Spirit of New Zealand. 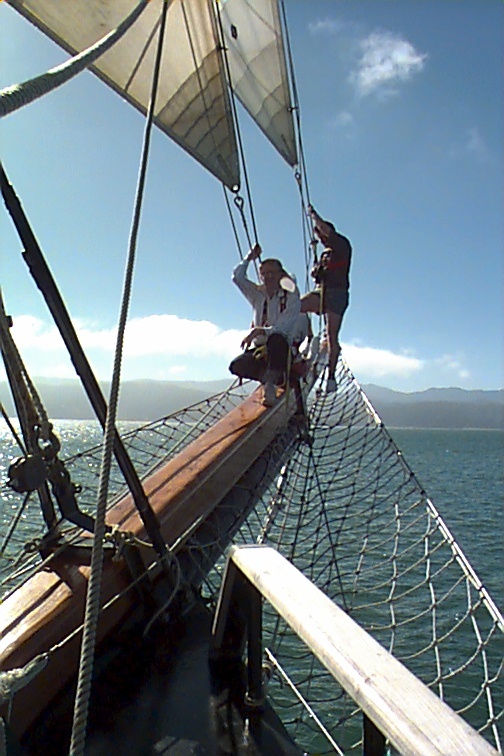 She was built about 12 years ago for the Spirit of New Zealand Trust which runs the ship as a leadership training vessel, mainly for teenagers. It is also chartered by corporate and other groups for leadership training cruises. 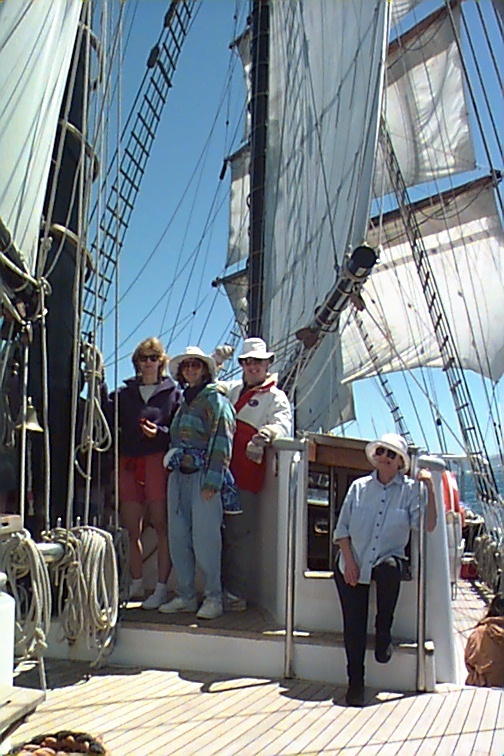 Our days sailing was kindly and specially arranged for us by Det. Sgt. Ken Burt of the New Zealand Police -- to Ken, our thanks. The Spirit of New Zealand is a steel hulled and masted barquentine (defined in the OED as a sailing ship with the foremast square-rigged and the remaining (usually two) masts fore-and-aft-rigged). . She displaces 225 tons. 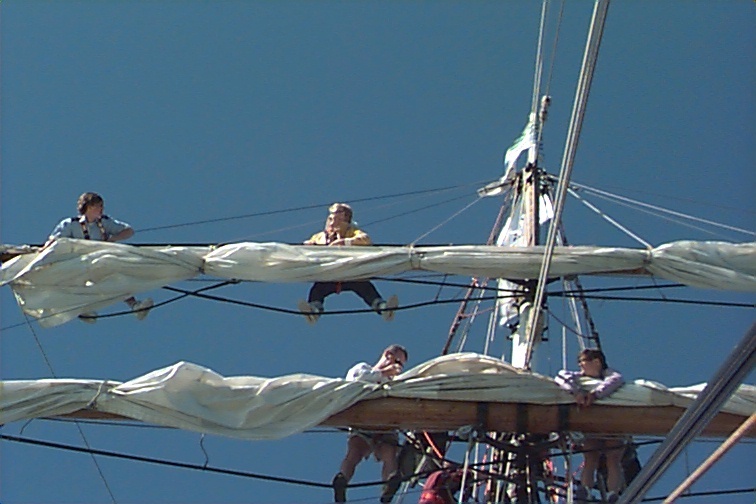 Her rigging includes three masts, three forward stay sails, two main stays, four square rigged sails on the foremast (from top to bottom, called the royal, the t'gallant, the main and the course). 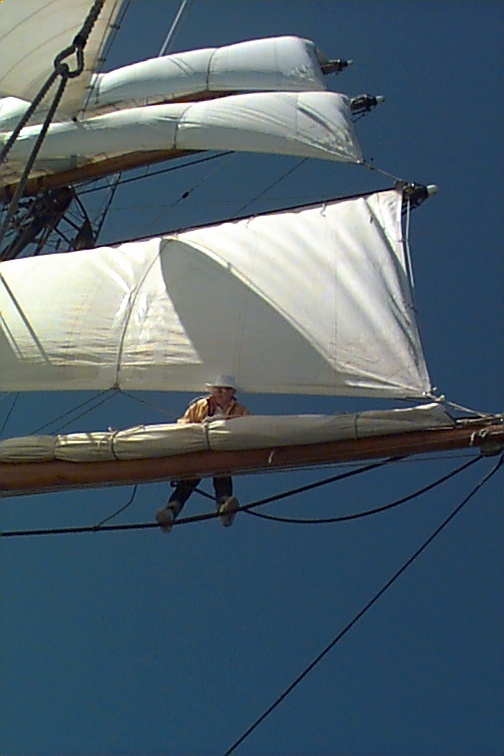 The main supports the main sail and the mizzen mast, the mizzen sail. 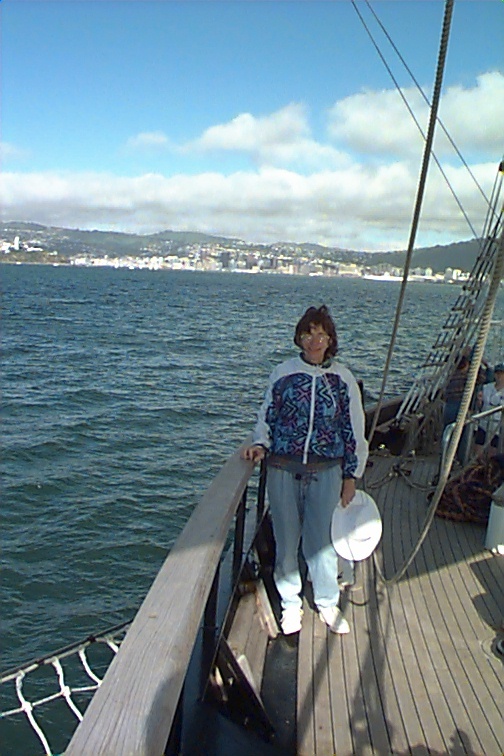 On the 15th, the weather in Wellington was great. We had a slight breeze, with temperatures in the '70's. We departed from the Queen's Wharf, Wellington about 8 in the morning. Our course took us out of Wellington harbour into Cook Straight which runs between the north and south islands of New Zealand. We made most of the trip out under power as to tack out would have taken 5 hours or so and we only had a little more time than that allotted to the trip. In the straight we tacked back and forth for a few hours, generally on a course of about 270 or 130 and at a speed of about 5-6 knots. Conditions were right for us to put on all sails, which created a magnificent sight. 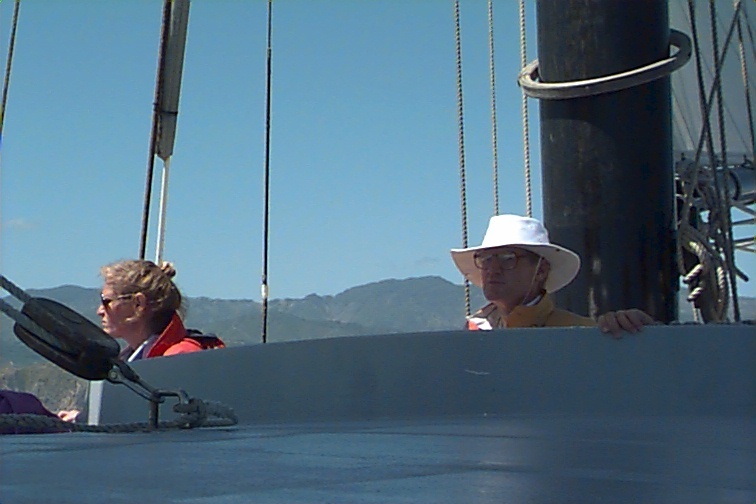 On the trip back into harbour, under full sail, we attained a speed of about 10 knots. At this speed even a school of dolphins were interested enough to join us and they spent several minutes playing in the vicinity of the bow. Once in the inner harbour we had time to sail around the harbour. The first task in obtaining power is to unfurl the sails. 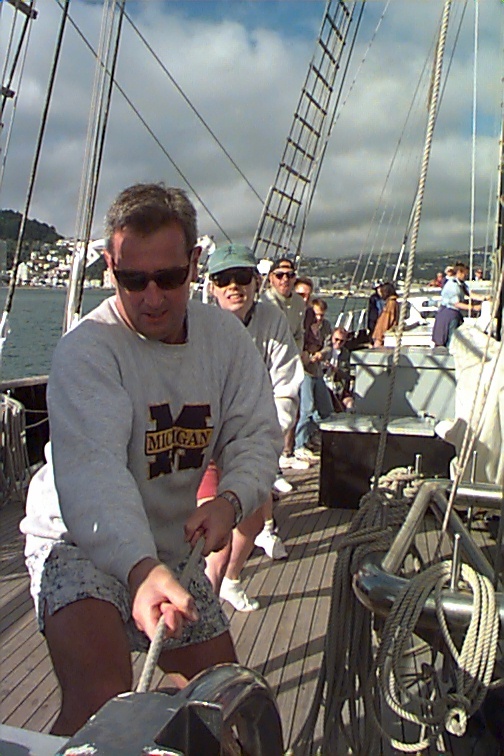 In this photograph, Ken is seen on the lowest yardarm unfurling the course sail. The sails above that have previously been unfurled (bottom to top) are the top sail, the top gallant and the royal.